Resaldo Nehemiah, hurdler, - "His hurdling technique really Isn't that good .. But he's a tremendous, natural sprinter." Women's volleyball - "Some of America's best female athletes are volleyball players, on the U.S. National Team. Two of them I've tested could be world-class javelin throwers or high jumpers." High jumping - "The computer shows the most efficient way ... Is to approach the bar straight-on, Instead of the side, take off on one foot and go over belly-down. Why no one does It. I don't know." action on her strokes. Increasing her error margin." Athletic shoes - "No one has come close to making the optimum shoe. The day will come when computerization can design the perfect shoe for any athlete for any sport. Some of them may be totally inflatable shoes." Weight training - "The next breakthrough will be electronic weight trainIng, where resistance Is programmed. It will enable an athlete to 'lift around' an Injury. Let's say he has a chest muscle injury and wants to bench press. At the point of peak pain, the resistance drops way down, then goes up again." Ann Meyers, basketball pro. -'"She has the potential to break the women's world record In the high jump. She can raise her center of gravity 60 centimeters In a vertical jump." Says University of Southern California track coach Vern Wolfe: "ArsI has a lot tai offer track coaches. His concepts help understand an event better. But he's off hl rocker when he suggests Americans area' Innovative. Americans pioneered weight training. We haven't exactly been sitting on our duffs." Jim Bush, UCLA track coach: "He's on the right track. He's a polneer in the scienï¿½ tific approach to training. The problem Is; very few coaches have backgrounds ha computers and silence. We need that; We're going toward the scientific approach and I feel like I've got to educate myself." Athletes like discus thrower Mae W114 kins and shotputter Terry Albritton have credited Ariel with helping them break world records. ANOTHER. 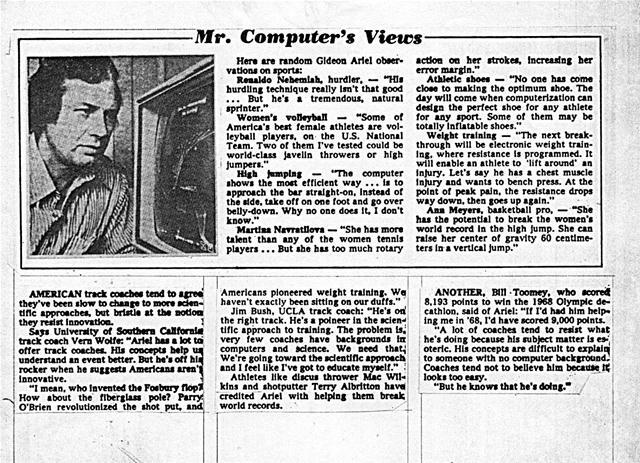 Bill -Toomey, who scow* 8,193 points to win the 1968 Olympic decathlon, said of Ariel: "If I'd had him helping me in '68, I'd have scored 9,000 points. "A lot of coaches tend to resist what he's doing because his subject matter Is es;,, oteric. His concepts are difficult to explain to someone with no computer backgroundCoaches tend not to believe him because. I looks too easy. Generated on 4/20/2019 11:17:01 AM (PST) ADI/HQ/GBA/2019/ARIELCLOUD/v3.0.2018.0126.